Horse population peaked in 1915, shortly after the mass introduction of the automobile. It’s been pretty much downhill as far as the work market for horses since then. But, of course, your job is still safe from the possibilities of the technology of innovation, right? What if you knew that technology innovation is moving at light-speed? Moving faster than your knowledge of the innovative extent? Replacing jobs needing humans in categories you’d thought impossible yesterday? My emotional reaction would be somewhere between the incredulity of fear and the disdain of apathy. That we are very quickly at the breaking point can be seen in an amazing video entitled, Humans Need Not Apply. 31 companies specializing in robotic automation illustrate the growing reality of technology innovation. This visual demonstration of the extent of technology innovation in the world of human jobs is very powerful. Robots are already invading the field of physical labor. For example, transportation drivers can be replaced by vehicles that drive themselves. Industrial driverless vehicles have great safety advantages as well. Self-driven cars have logged hundreds of thousands of safe miles up and down the California coast – already! Given that human drivers do everything from texting, to drinking, to eating to sleeping while driving, it’s not a stretch to realize this reality of technology innovation. Professional labor – lawyer, doctor and white collar – has a surprising amount of repetitive tasking that can be replaced by robotic automation. In the legal profession, for example, discovery can be expedited by current technology innovation allowing for rapid scanning thousands of pages of legal documents. This allows for correlation of concepts, dates and people through software analysis. Imagine the sleepless, thankless task of being that coffee-sipping, overworked drone, plodding through the mountain of drudgery. No longer! Technology innovation has come to the rescue. Don’t think that the creative field is exempt. The music on the video linked above is written by Emily Howell, a robot whose music is lovely. By the way, it is a necessary trend of technology innovation to name robots. To humanize them. Baxter is another robot who “has vision and can learn what you want him to do by watching you do it.” So he’s not that huge stationary robot programmed to do just one task at arm’s length. And, guess what!? He costs less than the annual salary of the average human worker. Technology innovation is cost-effective. 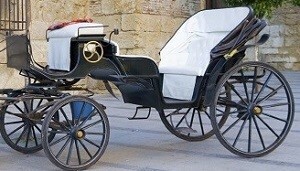 So why is the carriage without the horse? Because 100 years ago no one really thought horses would be out of work. Least of all the horses! But, in fact, technology innovation has replaced the real labor horse. Just the showy special occasion horse has some occasional gigs. So, if for horses a mere 100 years ago, how will humans fare with the mass of technology innovation taking place at light-speed? Three book titles sum up the attitude of those exploiting technology innovation. One, Tyler Cowan’s, Average is Over. This book speaks to the loss of the common laborer replaced by the drive for highly skilled humans who can match or control mechanical supremacy. Two, Erik Brynjolfsson’s and Andrew McAfee’s, Race Against the Machine. Here’s a book that tells us that “workers whose skills have been mastered by computers have less to offer the job market, and see their wages and prospects shrink.” Humans aren’t keeping up with technology innovation. Three, Robots will steal your job, but that’s ok, by Federico Pistono. The subtitle of the book pretty much says it all, How to survive the economic collapse and be happy. Crime doesn’t pay. But at least it knows enough to stay a few steps ahead of the end. Which for workers today is spelled, technology innovation.